The alleged Douma CW incident never happened. The official narrative was fabricated as documented by Robert Fisk. Residents and medical personnel were unanimous in their judgment. No attack occurred, no one ill or hospitalized from toxic CW exposure, no one dead, no one harmed in any way. US, UK, French April 14 terror-bombing of Syrian sites was based on a Big Lie. Why the unacceptable delay? The OPCW is notoriously pro-Western, its actions likely directed by Washington and/or Britain. It rubber-stamped the official falsified narrative on the alleged April 2017 Khan Sheikhoun CW incident – without visiting the town, relying on so-called evidence from anti-Syrian elements, notably al-Qaeda-linked White Helmets. No CW incident occurred. No site evidence suggested one. Khan Sheikhoun and Douma were replicas of each other – Syria and Russia falsely blamed for nonexistent CW incidents. Samples collected will be sent to the organization’s Rikswijk, Netherlands lab for analysis. 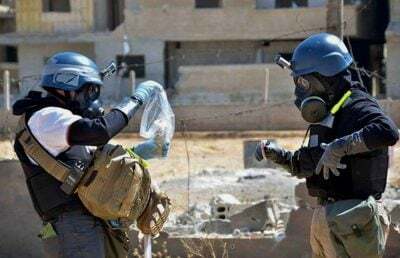 Based on the results, along with “other information and materials collected by the team,” it’ll prepare its “report for submission to the States Parties to the Chemical Weapons Convention for their consideration,” the press release added. Russian Foreign Ministry spokeswoman Maria Zakharova said the OPCW’s delay in visiting Douma for 11 days after receiving a formal request from Damascus to inspect the alleged site in question was “unacceptable (since) not only the Syrian side but the Russian military guaranteed security” for the team. Washington and supportive Western media falsely accused Syria and Russia of preventing the mission from entering Douma sooner. Here’s what’s at stake. If OPCW analysis confirms a CW incident, it’ll claim what didn’t happen. If its report finds no evidence of CWs used, Washington, its rogue allies, and Western media will accuse Russia and Syria of tampering with the site. Either way, the official falsified narrative won’t change, Syria declared guilty by accusation, further US-led terror bombing likely coming – notably because most missiles targeting Syrian military sites were destroyed in flight. Since taking office, Trump escalated US naked aggression in Syria instead of stepping back from the brink. Washington’s rage for dominance rules out any prospect for world peace and stability.